KOKOMO, Ind. -- Police have arrested a 17-year-old in the attempted murder of a 23-year-old Kokomo man. 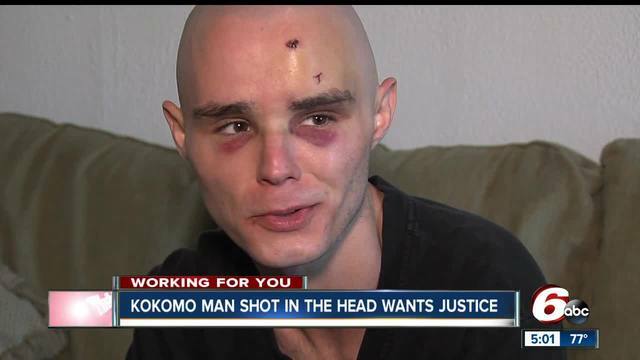 Austin Mealer, 23, of Kokomo told RTV6 on May 27 he was robbed of his cellphone and $300 by two suspects, who he said both shot him in the head. Mealer survived, but he and his mother have been vocal about wanting justice. Armando Shields was arrested Saturday and is preliminarily charged with attempted murder and robbery resulting in serious bodily injury, both felonies. Shields, 17, is due in court on June 7 and is being charged as an adult. A warrant has also been issued for a 19-year-old suspect in the attack, but he has not yet been arrested. Mealer told police he played dead after being shot the first time, and heard one of the suspects say “should I put another one in him” before he was shot a second time. Mealer said the suspects were considered acquaintances. Shields is known by the street name “Mondo Luis”, according to the probable cause affidavit filed in the case. Aysha Guffey, Austin’s mother, told RTV6 Monday she was relieved at least one arrest had been made. If you have any information on the second suspect or the shooting, contact Central Indiana Crime Stoppers at 1-800-222-TIPS.